When Mike Owens came over from Galesburg to join the Bradley basketball program he became part of a team that seldom lost a game. Given the task of running the potent attack of coach Chuck Orsborn that included such talent as Chet Walker, Mack Herndon, Bobby Joe Mason and Al Saunders, Owens responded to the role of floor leader and also became a pretty efficient scorer in his own right. 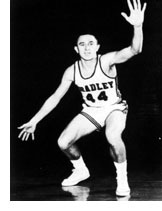 During his three varsity seasons Bradley went an amazing 72-13 and played in three National Invitational tournaments, winning in 1960 and finishing second in 1959. Bradley was 27-2 in Owens' senior year when he captained the Braves, losing only to Cincinnati and Houston. While running the offense and playing tight defense, Owens still was able to score 773 points in his three years. He was named to the first team all-NIT in 1960 and the second team in 1959. Also a fine shortstop, Owens signed with the Pittsburgh Pirates farm system after graduation but a knee injury cut short his baseball career. He then turned to high school basketball coaching and spent three seasons at Limestone, five at Arlington Heights Wheeling, one year as an assistant at Northwestern and four years at his alma mater, Galesburg, where he later became principal. He became athletic director at Moline High School in 1985.